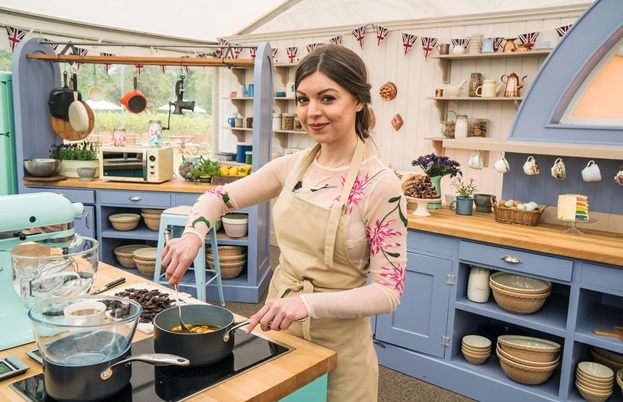 Bake Off is back, and while it might have changed channels it still has its quintessentially British charm. Luckily, we've got Howard Middleton (of series four fame) to offer his unique look at the debut episode. Margot from Margate is boycotting Bake Off. In her heart, she feels that’s what Mary would want. Instead, she pours a nice cup of tea into her Mary Berry Collection mug and cuts a generous slice of the Mary Berry Indulgent Chocolate Cake from Asda. Dear Margot will sleep well, satisfied that she’s taken a firm stance against the commercialism of the move to Channel 4. Meanwhile, back in the tent, there’s a promising recipe of familiarity and freshness; still sited at stately Welford Park, the kitchen woodwork now gets a lick of blueberry sorbet and mint macaron. 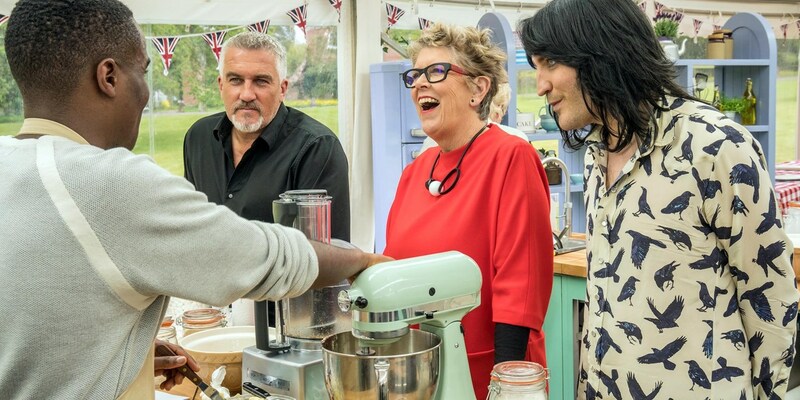 New judge, self-assessed ‘firm but fair’ Prue Leith, hits the spot when she says that cake ‘has to be worth the calories’. My depressingly bloated waistline bears witness to too many bad examples, though admittedly the consolatory red wine and salty yin of chips to cake’s sweet yang haven’t helped either. Sandi Toksvig, wearing a fitting tribute to the infamous Berry blouson, guides proceedings with genuine warmth and gentle skill. Noel Fielding promises deliciously dangerous eccentricity, yet so far looks like a man who’s discovered a fantastic line in shirts but still needs to find his feet. 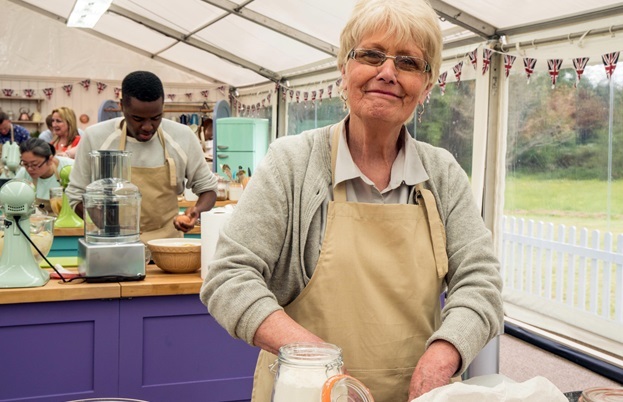 Pointing to the fact that ‘we’re all newbies here… apart from old blue eyes’, Noel introduces the tent’s scowling stalwart, Paul Hollywood… who smiles! Yes, the old misery guts seems to have had a bit of a personality makeover. I’d like to think of Paul as having changed… (I also like to think of Paul in burgundy lederhosen, but that’s a personal cross to bear). Sadly, I suspect any change may be skin deep as he literally appears to glow on screen. Perhaps he’s been given one of those old Hollywood (as in the movie capital) filters (usually a well-placed smear of Vaseline) or he’s using a particularly effective detox shampoo. Either way, he’s less silver fox, more pearlescent polar bear. Thankfully it’s still all about the bakers. 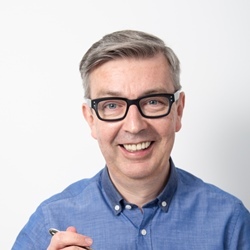 Naturally there are the ones that my partner Peter cruelly and prematurely describes as ‘cannon fodder’, but there are also some instant stars. Liam, Kate and Yan buzz with endearing enthusiasm, but it’s Liverpudlian Flo who instantly takes the top spot for lovability. Paul playfully mocks her accent as she chews on her words with relish, like a mouthwatering pan of scouse. Our first signature bake is a fresh fruit cake, where we’re told the fruit has to be fresh, not dried. Apparently that’s what makes it a fresh fruit cake. Who knew? James has dug into his allotment for the ingredients in his rhubarb, orange and ginger crumble cake. We witness James digging with his dad, searching for the orange, ginger and crumble crop, but unearthing only rhubarb. 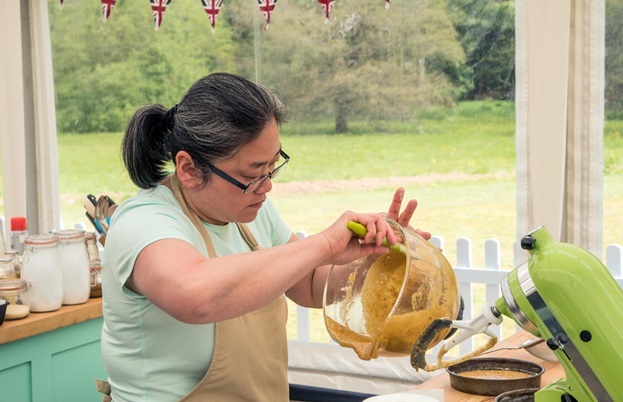 Four bakers have settled on apples – Stacey, Yan, Steven and Liam. Paul is unconvinced by Liam’s choice of a loaf tin for his apple and almond loaf cake, but the nineteen-year-old remains confident. Sadly it’s judged to be ‘a bit stodgy and a bit boring’. Yan’s windfall apple crumble cake isn’t baking as it should, then she realises her oven isn’t on. Faced with the prospect of a softly congealing disaster, she bravely starts again. It’s a wise move and her second attempt produces ‘a good sponge’. Flo realises too late that she’s forgotten the lemon curd (or ‘cared’ in Liverpudlian) for her citrus layer cake, but Prue likes it regardless. Tom’s gilded pear and cardamom cake hits the mark on presentation but is over-baked. Kate’s Moroccan strawberry and rose cake is judged to be too rosy and Paul calls it ‘style over substance’. However, it’s a charge that was repeatedly levelled at my fellow baker Frances Quinn and she ended up triumphant. Prue kindly calls James’ rhubarb cake ‘rustic’ in appearance and says there’s ‘nothing that a lot of custard wouldn’t help’. Paul isn’t convinced by Stacey’s spiced Granny Smith and walnut ring. 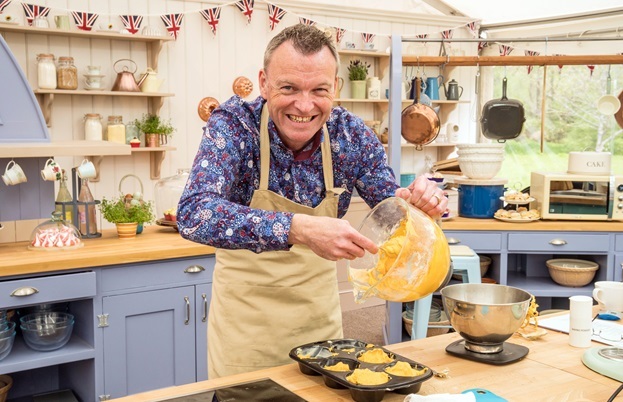 Clever Chris has used a spreadsheet to calculate the balance of ingredients – his fruity offering has no butter or oil and only two eggs. Prue raises her glasses along with her eyebrows. However, it turns out to be well baked, full of flavour but just a bit ‘squashed’. Poor Peter’s coconut cake seems to be compensating for its lack of fruit with a whopping five teaspoons of baking powder! Julia gazes at her damp creation and admits that she should have squeezed her courgettes. Steven’s stunning bonfire night apple cake wins the first Hollywood handshake of the series. Has there ever been one so early before? Before I have time to check, Paul’s proffering his coveted mitt again to Sophie, whose pineapple and coconut sandwich cake is graced with peaks of luscious Italian coconut meringue buttercream. Sophie is worried she may have peaked too soon. On to the technical challenge which is Prue’s take on the chocolate mini roll. The bakers must produce a dozen ‘pretty tricky’ cakes and get the swirl of minty buttercream just the right side of toothpaste. Chris fails to realise that the egg whites should be whisked separately and produces some flattened cracked cakes that amble towards the bottom slot. Kate rolls perfectly into first place. For the showstopper, the bakers must produce cakes that give the illusion of being something else. I take my hat-shaped cake off to the ambitious efforts. Kate is attempting to create a terrarium of plants using glacier mints for glass and Sophie is making sugar ice cubes for her bucket of Champagne. Russian-born Julia is nesting one doll cake inside another, whilst Chris creates ‘boiled eggs’ for a cake version of a raised pork and egg pie. Both end up a little rough around the edges but you can’t fault the ingenuity and creativity. Talking of which, Yan’s brilliant crafting of mango-flavoured ‘fish eggs’ for her banana ramen cake spawns the finishing touch for a Wagamama wonder. Flo’s impressive green-skinned watermelon cake reveals a stunningly vibrant red centre studded with chocolate seeds, though Paul thinks it lacks melon flavour. Tom’s book stack is deemed to be not detailed enough and the lemon and poppy seed cake crumbles into the pages of a fairly dry book. James’ croissant and coffee suffers a little morning droop but the cake flavour provides a welcome pick me up. Peter’s ‘bread on a bread board’ is somewhat overshadowed by Steven’s sensational loaf and BLT sandwich. Despite binning her sponge and starting again, Stacey’s evening handbag has the unfortunate appearance of a hedgehog with a curly perm. Paul was unconvinced (again) by the description of Liam’s stack of pancakes but he’s forced to eat his words, along with a very tasty cake. Liam jumps back on his stool with renewed pride. Sadly, it all ends with that battle of the bread cakes, as Peter becomes the tent’s first casualty and Steven phones his mum to tell her a sandwich has made him star baker. Prue hugs the bakers with genuine affection and Paul tries that smiling thing again. Welcome back Bake Off. Dear Margot from Margate – I think you’re missing a treat.